How does a piece of media achieve global recognition and cross-cultural approbation? At what point is something "good" enough to become a cultural touchstone for not just its country of origin, but every country it is watched in? These questions are best embodied in the British period drama series Downton Abbey, the quintessential example of a phenomenon that has reached thousands of audiences despite never departing from its insular setting and theme. Certainly, it would make sense that such a show would captivate audiences in the UK and perhaps the neighboring European countries it references, but the show has achieved rampant popularity on a massive scale. Marketing and positive reception of the first series might answer the question of "how", but the question of "why" remains unsolved. Why are we so engrossed in the lives of urbane, occasionally snobby British elite whose troubles are shallow and their actions so often petty? Maybe that question will finally be answered in the last series of the widely beloved program. Season Six finds the Crawley family struggling to maintain the opulence of both their home and their standard of living in the year 1925. Life is changing at a breakneck pace and not always for the better. Mary (Michelle Dockery) is being courted by car enthusiast and racer Henry Talbot (Matthew Goode), but is too embittered by her husband's death and her own pettiness to reciprocate his advances. Edith (Laura Carmichael) is preoccupied with her magazine and a crotchety editor, as well as a suitor of her own, Bertie (Harry Haden-Paton): however, fear regarding her fatherless daughter prevents her from committing to him. Tom Branson (Allen Leech) and little Sybbie have returned to Downton, where he struggles to find a new direction for his life and also play cupid with Mary. Cora (Elizabeth McGovern) is embroiled in a nasty argument concerning the local hospital with the Dowager Violet Crawley (Maggie Smith), and seeks an ally in Isobel Crawley (Penelope Wilton). And poor Robert (Hugh Bonneville) is just trying to cope with the changes and a persistent ulcer. Things aren't any less complicated downstairs. Though Mrs. Hughes (Phyllis Logan) and Carson (Jim Carter) are now married, they quarrel over the duty of cooking for themselves. Anna (Joanne Froggatt) is dejected due to her repeated miscarriages and fears she is disappointing her husband John (Brendan Coyle) by failing to provide him with children. Both Daisy (Sophie McShera) and Mr. Molesley (Kevin Doyle) are hoping to pass their exams in order to achieve a higher education; Daisy is also lobbying to secure land for her father-in-law, Mr. Mason (Paul Copley). Thomas Barrow (Rob James-Collier) is trying to find a new home to serve, while also struggling with crippling loneliness and an unrequited affection for footman Andy (Michael Fox). Just reading a synopsis for the season is exhausting (and some lesser plotlines were excised from the above summary for the sake of time). Downton Abbey has no shortage of characters and plotlines, which can be something of a blessing (if one particular subplot is remarkably boring, it will quickly be followed by something more interesting) and a curse. Due to the staggering volume of stories here, some get sidelined in order to focus on others that are so incomprehensibly unnecessary that it makes one wonder if there wasn't a story editor in the writer's room. The hospital argument in particular begins as a dead horse that the writers insist on beating in the hopes something of note will result. There are several of these in this series and while they are definitely contrasted by more exciting stories, they are a huge detriment to an otherwise entertaining show. And that's where the massive appeal of the show lies--entertainment. It's no surprise that the series' attempts to tackle more emotional or sentimental themes often flounder: this show is not a mouthpiece for deep, insightful thoughts. We aren't invested in the dying post-Edwardian age or the decadence that the Crawley family will have to give up (although this season has a few touching moments where we finally sympathize with the characters about the changing times). We care about the drama, the caustic remarks, the characters and their respective scandals, heartbreaks, and victories. Unlike other PBS dramas of similar composition, Downton Abbey succeeds because it is unabashed about its intentions: it exists to captivate us, not lecture us. And was it satisfying? Yes. There is no shortage of grandeur in this season in spite of the decaying standards, from resplendent dresses to posh dinner clubs to opulent castles. The characters are as they ever were: either delightfully wicked (Mary) or aggressively martyrish (Edith, Anna). And the dramatic scenes are magnificent, from the aforementioned dinner fiasco to a heated confrontation between Mary and Edith to an incredibly depressing quasi-resolution to Barrow's rocky story. We may never know exactly why the doings and happenings at Downton Abbey are so enchanting, but its appeal is best expressed in a hilarious scene where the Crawley family gives a tour of Downton Abbey. "I don't think I've ever noticed that," a mystified Cora says when a patron points out a piece of art. The Crawley family doesn't acknowledge the extent of their wealth and never really has to. The same can be said for the show: there is no need to ponder its massive allure. That's just the way it is. 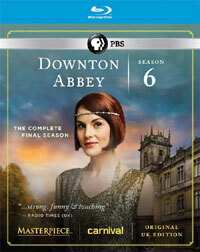 Downton Abbey: Season 6 reminded me of my trips through Biltmore House on Blu-ray Disc courtesy of PBS Distribution. The three-Disc set contains all nine episodes from the show's sixth season. The show has been letterboxed at 1.78:1 and the Disc contains an AVC 1080p HD transfer which runs at an average of 25 Mbps. The image is incredibly sharp and clear, showing no overt grain and no defects from the source materials. The colors look fantastic, as the show goes a great job of contrasting bright tones with earth tones, and the image is never overly dark or bright. The image does get a touch soft at times, but the depth is impressive. The video more than rivals HD broadcast quality. The Disc carries a DTS-HD Master Audio 2.0 track which runs 48 kHz and an average of 1.7 Mbps. The track provides clear dialogue and sound effects. The audio is fine for a sedate drama like this, but we don't get any notable dynamic effects. The dialogue is always clear and we get some subtle stereo effects, but otherwise, you won't be using this as an audio demo disc. The Downton Abbey: Season 6 Blu-ray Disc contains four extra features. "Farewell to Highclere" (7 minutes) is a tribute to the actual house which serves as "Downton Abbey". The cast shares their views on what it was like to see the building for the first time, while a historian gives us facts about it. "The Cars of Downton" (11 minutes) looks at how automobiles fit into the timeframe and story of Season 6, and then how the team re-created the look of a 1920's racetrack and the inclusion of the antique cars. "Changing Times at Downton" (14 minutes) explores how families living in houses like Downton Abbey is becoming a thing of the past, which is one of the major themes of the season. The piece also examines how part of the appeal of the show is how it gives us a detailed look at how a very different class lives.